Preheat the oven to 200°F. Line two rimmed baking sheets with parchment paper or a silicone baking mats. Rinse and dry the cranberries and remove any browned or soft berries. 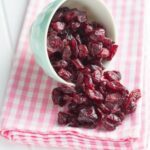 Slice the cranberries in half and add them to a mixing bowl. Add the sweetener, avocado oil, and orange extract, if using. Toss to evenly coat all of the berries. Line the berries in single layers across the baking sheets. Bake for 3 to 4 hours, rotating the racks half way through.